the new home of Lindsay Hayes Equestrian AND to celebrate our first anniversary in business! Friends and family are welcome to join in, I'm really looking forward to have the chance to thank everyone for their support over the past year. Some of you have asked about bringing friends interested in taking lessons, and they are more than welcome as well. Saturday May 30th (weather permitting), we will be attending a horse show in Dorchester. It is a local club show that has a fun "team challenge" for charity. Students and families are encouraged to come for all or part of the day. 4939 Hamilton Rd., London, ON. AQHA stands for the American Quarter Horse Association. 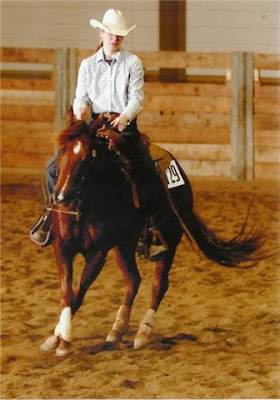 AQHA shows consist of a wide variety of events including Western Pleasure, Trail, Horsemanship, Equitation and Reining. Peanut and I went to our first AQHA show in February, and our second AQHA show (pictured at left) at the same facility (Michigan State University), Easter weekend. Peanut earned us an AQHA point on Easter weekend (coincidentally it was also my birthday!). To earn a point, a horse and rider combination must earn 1st, 2nd or 3rd place. 3 points are earned by the first place winner, 2 by the second place winner and we earned 1 point for our third place. Points are added to that horses official record. It's kind of a neat way to keep track of a horse's accomplishments but even more importantly it's a way to determine how successful a potential dam or sire has been in the show ring. For example if I were going to sell Peanut, someone could look her up by her registered name on the AQHA database. Her registered name is Smart Like Jac. From there they could see how many shows she has been to and how many points she has earned. Then, they could also track her bloodlines. If they were interested in seeing her sire's show record, her dam's show record, her brothers, sisters, etc. they would all be readily available. NRHA stands for National Reining Horse Association. The NRHA is the governing body for the sport of reining world-wide (and not just within the nation as the name suggests). The NRHA is obviously more specific for the sport of reining, and is not limited only to Quarter Horses. Being involved in the NRHA is a little more complex and requires 2 memberships, one to NRHA and one to Reining Canada, as well as a competition licence for the horse. Peanut and I went to our first NRHA show in Hamilton on Mother's Day weekend. We scored 69.5 consistently and earned 2 first place ribbons on the first day in the Rookie Professional class and in the Limited Open. The second day we earned a 2nd in the Rookie Professional and 3rd in the Limited Open. So what the heck is Rookie Professional and Limited Open? Any person who accepts money to train or teach automatically loses their "Non-Professional" status. So right off the bat I have eliminated a lot of classes I could have potentially shown in (for example the Green as Grass is for people just starting their show career, the Beginner classes, Rookie, and all the Non-Pro classes are out). Within the Open division there are 4 categories: Rookie Professional, Limited Open, Intermediate Open and Open. These categories are all based on the dollar earnings for that rider. NRHA shows award money instead of points like the AQHA. So riders competing in the Rookie Professional must have less than $5,000 in earnings, Limited riders must have earned less than $10,000. Intermediate less than $50,000 and the Open class is for anyone. The Open classes are all run concurrently, so I cross-entered and only had to run one p attern to score in two categories. Congratulations to the Hannaford family on their new arrival! "Jordan" was born a week ago Friday out of LeeAnn's mare "Sister". Bridgecreek Stables is a boarding facility on Bells Road, just a few kilometres from the main lights in Lambeth. It houses one of my training horses at the moment. Two horses from Bridgecreek Stables had been in training with me since the beginning of the year. As promised, a few students have already been out to see the colt. Since he is so young, so timid and still so vulnerable we can't arrange a big group outing to see him. Visits will be spread out and in small groups of people. So far, Sister has been a very sweet mother to share her baby and it is important for students to learn about the dynamics between mares and foals, and how not to be too intrusive. If you are interested in seeing the colt, please remind me so we can try to set up a time that would be suitable. And here's Presley, waiting quietly and staying very still. Jordan stuck close to Mom for a while. Gradually, he got braver and started to peek out from behind her. Then he'd run and jump and scoot back behind her to his safe spot! Eventually, he decided Presley was worth investigating and came over for a good sniff and look at the camera. Presley also had the pleasure of holding one of the newborn kittens. It's eyes weren't even open yet! Thanks again to Bridgecreek Stables for allowing us to come out and share this special time! Do YOU have O.C.E.A.N. Syndrome? Just recently, after years of research, I have finally been able to give a name to what my wife and I have been living with for years. It's an affliction, for sure, which when undiagnosed and misunderstood can devastate and literally tear a family apart. Very little is known about O.C.E.A.N. Syndrome. But it is my hope this article will generate interest from researchers involved in the equine and psychological sciences. You will, no doubt, begin to identify similarsymptoms in your own family and hopefully now be able to cope. Obsessive Compulsive Equine Attachment Neurosis Syndrome (O.C.E.A.N.) is usually found in the female and can manifest itself anytime from birth to the golden years. Symptoms may appear any time and may even go dormant inthe late teens, but the syndrome frequently re-emerges in later years.Symptoms vary widely in both number and degree of severity. Allow me to share some examples which are most prominent in our home. 1. Can smell moldy hay at ten paces, but can't tell whether milk has gone bad until it turns chunky. 2. Finds the occasional "Buck and Fart" session hugely entertaining, but severely chastises her husband for similar antics. 3. Will spend hours cleaning and conditioning her tack, but wants to eat on paper plates so there are no dishes. 4. Considers equine gaseous excretions a fragrance. 5. Enjoys mucking out four stalls twice a day, but insists on having a housekeeper mop the kitchen floor once a week. 6. Will spend an hour combing and trimming an equine mane, but wears a baseball cap so she doesn't waste time brushing her own hair. 7. Will dig through manure piles daily looking for worms, but does not fish. 8. Will not hesitate to administer a rectal exam up to her shoulder, but finds cleaning out the Thanksgiving turkey cavity for dressing quite repulsive. 9. By memory can mix eight different supplements in the correct proportions, but can't make macaroni and cheese that isn't soupy. 10. Twice a week will spend an hour scrubbing algae from the water tanks, but has a problem cleaning lasagna out of the casserole dish. 11. Will pick a horse's nose, and calls it cleaning, but becomes verbally violent when her husband picks his. 12. Can sit through a four-hour session of a ground work clinic, but is unable to make it through a half-hour episode of Cops. 1. Must come to terms with the fact there is no cure, and only slightly effective treatments. The syndrome may be genetic or caused by the inhaling of manure particles which, I propose, have an adverse effect on femalehormones. 2. Must adjust the family budget to include equine items - hay, veterinarian services, Farrier services, riding boots, and clothes, supplements, tack, equine masseuse and acupuncturist - as well as the (mandatory) equine spiritual guide, etc. Once you have identified a monthly figure, never look at it again. Doing so will cause tightness in your chest, nausea, and occasional diarrheal. 3. Must realize that your spouse has no control over this affliction. More often than not, she will deny a problem even exists as denial is common. 4. Must form a support group. You need to know you're not alone - and there's no shame in admitting your wife has a problem. My support group, for instance, involves men who truly enjoy Harley Davidson's, four-day weekends, and lots of whiskey. Most times she is unaware that I am even gone, until the precise moment she needs help getting a 50 pound bag of grain out of the truck!